SportRack SR5512 Kayak Roof Rack Saddles and cartop kayak carriers..
mounting hardware, and heavy-duty straps. - Maximum kayak protection with integrated rubber pad. - Eliminates hot spots with large contact surface area. most factory installed cross bars. Installs in minutes. - Additional safety provided by bow and stern tie downs. your canoe to your rack. Note: Fits Thule, Yakima and most factory roof racks. 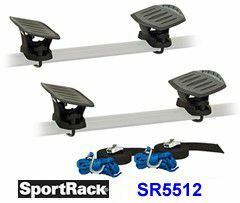 The SportRack SR5512 kayak saddle rack attachment includes Universal mounts to attach to most car or truck roof racks and includes a full 4 mounting pads to carry one kayak. The SportRack SR5512 is a great value in a kayak rack and the kayak pads are flexible and will conform to your kayak's hull.